My new thing is finding blogging groups. I like having a theme and a designated day to post something. It gives me a challenge and holds me food-responsible for something. 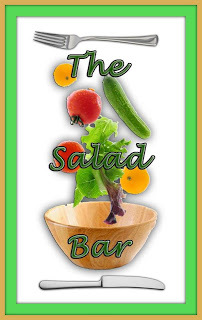 Last month I joined The Salad Bar Blogging Group, which is a Facebook group for bloggers who have a themed salad recipe. The theme last month was fruit and I was sad I didn’t get a chance to participate so I made an extra effort to participate in this one. Anyway, the theme for this month is Potluck salads. I immediately knew that I wanted to make macaroni salad. My mom makes it all of the time and usually adds in shrimp, but I opted to skip that since its warm out and mayo and shrimp in a salad during warm temps is just asking for trouble. 1. Bring a large pot of water to a boil. Cook macaroni noodles according to package directions. 2. Drain and rinse. Set aside until slightly cooled. 3. Meanwhile, combine mayonnaise, sour cream, cider vinegar, sugar and dry mustard together in a small bowl. 4. Once macaroni is slightly cooled, stir in celery and mayonnaise mixture until all of the macaroni is covered. Season liberally with salt and pepper. 5. Transfer to a lidded bowl and refrigerate until chilled or up to 3 days. The Food Network recipe calls for onion and parsley in the recipe which I opted to omit. My mom never puts onion in her macaroni salad and I just can’t picture it in there. I had initially planned to keep the parsley in the salad, but my parsley plant was looking a little sparse after some frequent uses recently so I decided to just skip it. The best thing about this salad is how far in advance you can prepare it. The flavors only get stronger over time so there’s nothing wrong with making this on a Thursday to serve to your Saturday party guests. This sounds like a great basic macaroni salad! Sometimes it's the tried and true that everyone enjoys at a potluck event. Yours looks great too. 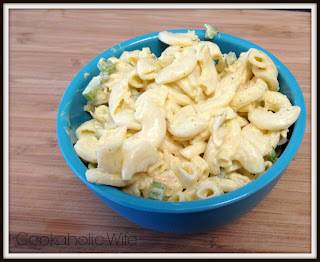 Your Macaroni Salad sounds delicious and easy! I cant wait to make it for my family. Sometimes simple and basic is the best, isn't it? I like the sour cream addition. I love macaroni salad. This sounds a lot like a salad my grandmother used to make. She put shrimp in hers too. Yum! I like using the cider vinegar. I have been using rice vinegar mostly and it is a time for a change.